PCR rounds up some of the more exciting new PC peripherals and other products announced at Gamescom 2015 this week, from Skylake to new Cherry switches. 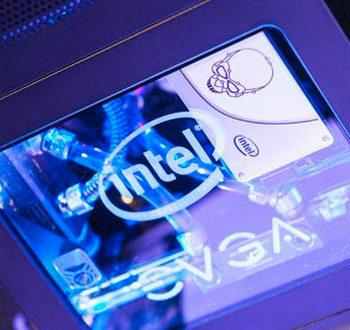 Intel has finally launched its two new 14nm 6th Generation Core processors, also known as Skylake processors. The two new quad-core desktop CPUs are the i7-6700K ($350) and the i5-6600K ($243), clocked at 4.0 GHz and 3.5 GHz respectively. 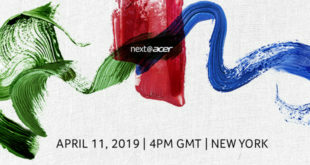 The pair have launched today, with more in the new processor family coming later this year. This new chipset supports DDR4 memory and is said to achieve 30 per cent greater performance than that of a three-year-old PC based on Ivy Bridge architecture, 20 per cent better than Haswell and 10 per cent better than the current Broadwell chips, reports The Inquirer. PCR understands the first machines featuring the new processors are going on sale this week from UK system builders. Last month, Intel delayed its upcoming 10-nanometer (10nm) Cannonlake chip technology from 2016 to 2017, effectively breaking its own ‘Moore’s Law’. Acer has lifted the lid on what it calls the “Unstoppable Fighting Machine” – the Acer Predator G6-710 gaming desktop – at Gamescom 2015. 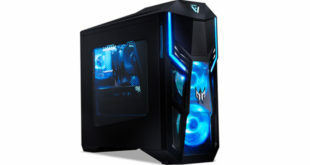 The Predator desktop (pictured, above and above right), priced at £1,299 and available in mid-September, features an armour-like shell design and is powered by the latest 6th Generation Intel Core i7-6700K processors, running on Windows 10. It features 64GB of DDR4 dual-channel memory, a ‘One-Punch’ CPU overclocking capability, an IceTunnel cooling system and Wi-Fi 802.11ac. The PredatorSense control hub offers full running stats such as CPU clock rate, temperature, and fan speed. Players can also adjust the lighting, fan and the overclock stage through the portal. It’s powered by Nvidia’s GeForce GTX 980 with UHD 4K2K (3840 x 2160) display capabilities, and comes with Creative Sound Blaster X-Fi MB5 (with EAX) 5.0 and 5.1 channel audio support, plus four audio jacks. It houses expansion slots (1 x PCI-E X16 slot, 2 x PCI-E X1 slots, 2 x M.2 slots), with support of up to 12TB of storage (expandable by a further 512GB with SSD). It also come with the included SteelSeries APEX RAW keyboard and SteelSeries Sensei RAW gaming mouse, and USB port provision (6 x USB 3.0/ 2 x USB 2.0). Corsair has shown off its new Scimitar RGB PC gaming mouse, which has 12 buttons on its side, targeting players of MMOs like World of Warcraft as well as MOBAs like League of Legends. The thumb buttons are mounted on a sliding pad, which can move forward or backward by 8mm. It’s out this September priced at $80, reports PC Gamer. The vendor also announced three new Void headsets, featuring RGB lights and better battery life. These are due later this month priced at $130 (wireless 7.1), $100 (USB 7.1) and $80 (stereo analog). Lastly, Corsair has secured an exclusive agreement with Cherry (see below) to put new Silent MX switches in two new Corsair products: the Strafe RGB and the Strafe RGB Silent. Corsair ditched its old gaming logo recently. Corsair has exclusively secured this technology for the first six months after launch, to introduce the first gaming keyboard with the new MX Silent switches. Cherry says these are its quietest mechanical key switches with patented noise reduction. The Silent Switch within the MX family boasts noise reduction with integrated 2-component tappets, reducing audible clicks to ‘the acoustic minimum’ at the top and bottom ends. 16.7 million colours can be displayed when using the corresponding LED with high luminosity, and Gold-Crosspoint technology guarantees lossless input of over 50 million keystrokes. The switch will be available in two versions – MX Red and MX Black switches. Mad Catz has teamed up with developer Cloud Imperium Games to create a range of officially licensed simulation products for space PC game Star Citizen. The new range of hardware – no doubt including a joystick – is expected to ship in 2016 and will be released under the Saitek simulation brand. “As one of this current generations’ most anticipated games, we are excited to be working alongside the creative forces behind Star Citizen to create a full range of simulation products that we believe will bring an added dimension of immersion to the Star Citizen experience,” said Darren Richardson, President and CEO of Mad Catz. 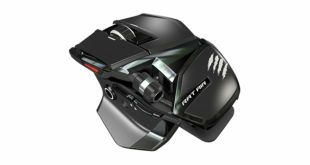 Mad Catz also announced the start of pre-orders for its R.A.T. PROX PC gaming mouse which is compatible with Windows 10. Seagate Technology has announced a new 2TB Game Drive for Xbox One and Xbox 360, the result of a marketing relationship with Microsoft. This new USB 3.0 external drive is priced at $99.99. With today’s game installs averaging 35GB to 50GB, having space on the console to support a library of Xbox games is more important than before. This drive means that gamers won’t need to delete games from the Xbox’s hard drive in order to store more. Look past the overly dramatic piece of video marketing above and you’ll find a unique mouse that should appeal to a lot of gamers. The Roccat Nyth is a MMO-hybrid gaming mouse that has a swappable side button grid, replacable side grips and 33 buttons giving gamers 36,738 different combinations, so they can move buttons around and arrange it as they like. More interestingly, after Gamescom 2015 Roccat will launch an online 3D printing library with a host of button themes, ergonomic options and additional special parts that users can create and use to individualize their Nyth. Rene? Korte, founder and CEO of Roccat Studios, said: “Making a mouse so deeply customizable was a great test for our creative and design teams. What we ended up with was not only a one of a kind MMO-centric piece of gaming equipment, but a mouse that is a chameleon. Turn it into a MOBA mouse, an FPS weapon, and more; any gaming configuration for any genre you can think of. That’s what the Nyth brings to the table." Razer has announced the launch of the Razer Orbweaver Chroma (pictured right), a customisable, mechanical gaming keypad. It’s designed for tournament-grade controls and colour synchronization with other Razer Chroma-enabled devices. Building on the original Orbweaver, the new €129.99 version provides gamers with 20 programmable Razer Mechanical Switches; an eight-way directional thumb-pad; adjustable hand, thumb and palm modules; and lighting features. The Razer Orbweaver joins other Chroma-enabled Razer devices, including the Razer DeathAdder Chroma and Razer Naga Epic Chroma gaming mice; the Razer BlackWidow Chroma gaming keyboard; the Razer Kraken 7.1 Chroma headset; and the Razer Firefly gaming mouse mat. All Chroma-enabled products feature 16.8 million customizable colour options and effects enabled through Razer’s Synapse driver software. Also at Gamescom, Razer launched the DeathStalker Chroma gaming keyboard, which is priced at €119.99. Electronic Arts revealed that The Sims 4 Get Together Expansion Pack is coming to PC and Mac this November, including a boxed retail version. Brand new to The Sims 4, players can introduce their Sims to a variety of different clubs, featuring Sims with distinct interests, personalities and behaviors. Windenburg is a new world, with picturesque locations for players’ Sims to explore. Players can also take their Sims to local hotspots to gossip over an espresso at the café, play games with their pals in the pub, dance at the disco and more. Speedlink is showing new roll-up mouse pads in three sizes and a cable holder for gaming mice at Gamescom 2015 this week. The ATECS XXL is 100cm long and 50cm wide, designed for home gaming or LAN parties. other sizes include M (38cm x 30cm) or L (50cm x 40cm). The XXL mouse pad will be available for €19.99, M and L for €7.99 and €12.99 respectively. These will arrive in time for Christmas. Also new in the Speedlink range is the cable holder for a gaming mouse. The new mouse bungee will be commercially available starting October for €9.99. Turtle Beach’s newly announced line of headsets from E3 are on display at Gamescom again this week. They include the EAR FORCE Stealth 450 wireless PC gaming headset with premium features like ‘Superhuman Hearing’ and DTS Headphone:X 7.1 Surround Sound, the EAR FORCE PX24 that comes with Turtle Beach’s EAR FORCE SuperAmp battery-powerful in-line amplifier that delivers audio from any connected device, as well as the entry-level EAR FORCE Recon series PC and console headsets. This new Chatpad connects to the bottom of an Xbox controller (when using the console or a Windows 10 PC). It lets the user compose messages to friends, enter codes and search apps quickly. It also includes a chat headset with 3.5mm jack, which can be plugged directly into the Chatpad. It’s out on November 3rd priced at around $34.99.